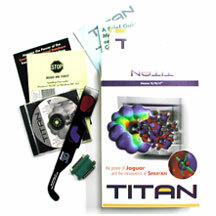 Titan is the union of Wavefunction's versatile, easy-to-use Spartan interface with fast, computational algorithms from Schrödinger's Jaguar. TITAN has a fully-featured graphical interface that many consider to be the best in the business. In very little time, you can build and manipulate molecules, display computed graphics, and see the answers to your most complex chemistry questions. TITAN provides a wide range of computational methods to the PC Windows environment in order to address the needs of educators, bench chemists, and professional molecular modelers. All methods are easily accessed via the seamless graphical interface, putting real computational power just a few clicks away. Molecular Mechanics. TITAN provides both SYBYL and MMFF94, a new generation force field parametized especially for organic molecules and biopolymers. Semi-Empirical. Semi-empirical methods are a melding of the quantum mechanical framework with approximations, empirical data, and parameters. TITAN includes MNDO, MNDO/d, AM1, and PM3 including parameters for transition metals. Hartre-Fock Molecular Orbital. Hartree-Fock models remain a mainstay for quantitative investigations of structure and energetics. Density Functional Theory (DFT). Density functional models introduce electron correlation in an explicit manner and often provide equivalent results to more costly (time consuming) techniques such as MP2. A variety of popular functionals are included in TITAN, including SVWN (local density model), gradient corrected BP and BLYP models and the hybrid B3LYP model. LMP2. "Localized" MP2 is a reliable and computationally efficient way to introduce introduce electron correlation via the popular MP2 approach. All-Electron and Pseudopotential Basis Sets. TITAN offers a full range of Gaussian basis sets for Hartree-Fock, density functional, and LMP2 calculations. All electron basis sets include (among others) 3-21G, 6-31G* and cc-pVTZ with extensions for additional polarization functions and/or diffuse basis functions. Pseudopotential basis sets include LAV3P, LAVCP and LACV3P with extensions for polarization and/or diffuse basis functions. Solvation. TITAN provides the SM5.4 model for quantitative estimates of aqueous solvation energies. Properties Calculations. Including QSAR Descriptors and Vibrational Frequencies.